Want to enjoy a fresh Italian lunch or dinner, but can’t get out of Canton, MA right now? Let Bertucci’s take you on a short trip to Italy with our authentic fare we cook fresh every day. Our scratch-made dough, specially grown tomatoes, and mouthwatering roasted vegetables are always fresh, no matter what day or time you come in. Whether you decide to dine on a signature pizza straight from our brick oven, a perfectly seasoned pasta dish, or a sugary treat from our dessert offerings, we always put extra attention into every dish we create. Our team puts a great deal of effort into cultivating a warm, comfortable environment that is ideal for any occasion you and your loved ones may be celebrating. From big events like birthdays and anniversaries to simple, spontaneous nights out, we’re here for you. No matter what you order from our authentic Italian menu, your taste buds are in for a treat. Every dish we serve is carefully made using only the freshest ingredients. We source our vegetables from regional small-batch sources and use tomatoes that are grown just for us. 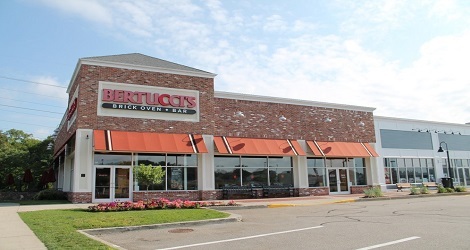 Whether you order one of the brick oven pizzas we’re famous for, a calzone made just the way you want it, or a sweet treat from our dessert offerings, you’ll never be disappointed when you’re dining at Bertucci’s! If you can’t make it in, contact us online or by phone for 2Go or delivery.